Don’t stress! There will be things that come along that require a lot of energy and time, and they are very important. Focus on the things that must be done. Something that has a deadline. But don’t stress the small stuff. Whether those small things are dishes, laundry, or something else that won’t have a consequence if it doesn’t get done by a certain day. Make a list. Every day I have a list of what I need to get done. There are some very important things on that list, along with items that aren’t all that important. If I don’t get one thing done on that day, I move it to the next day. Once I’ve completed a task, I cross it off. Nothing feels better than crossing items off my list. Write down everything that needs to get done and add to the list if needed. 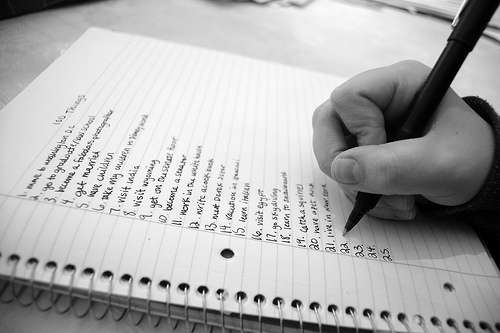 I will write down everything that needs to get done, no matter how small the task may seem. The items I need to get done and write down will vary from things I need to do at my current job, items I need to do for Elite Health Coaching, along with things I need to get done around the house, like laundry. Just relax and breath. If you have a lot to get done, but don’t see a way of finishing everything in the time allotted, ask for help. This is the hardest thing for me to do. I hate asking for help! I want to be Superwoman, but sometimes that just isn’t possible. Ask for help to relieve the stress that you are experiencing. This will not only make you a happier person, but when you are less stressed and are able to relax, everyone around you will feel the same way.